Chelsea and Man City collide in a most anticipated Premier League clash this Saturday and 888sport are offering enhanced odds on the match! Find here how to claim Chelsea to win @ 15/1 or Manchester City to beat the Blues at 12/1! Chelsea have won seven of their last eight matches since an opening day defeat to Burnley while Manchester City are unbeaten this season and have won each of their last seven matches. Who will claim the bragging rights? 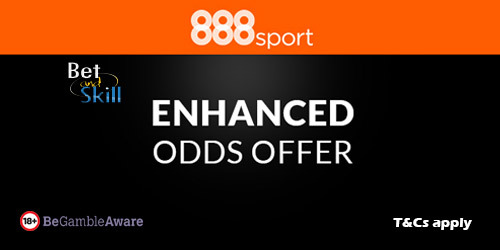 Join 888sport and choose your price boost - 15/1 CHELSEA or 12/1 MANCHESTER CITY to get all three points! Promotion is valid until September 30th 2017 19:29:59 GMT. Any bets placed after the start of the Chelsea vs Manchester City match will be paid out at normal odds. A qualifying bet is a ‘real money’ stake of at least £5 placed on either Chelsea or Manchester City to win. (‘Match’ winner market only). Only the first bet placed following registration on either Chelsea or Manchester City will qualify for this promotion. Free bet tokens will be applied to qualifying accounts on the 1st of October 2017 (please allow 72 hours in extenuating circumstances). 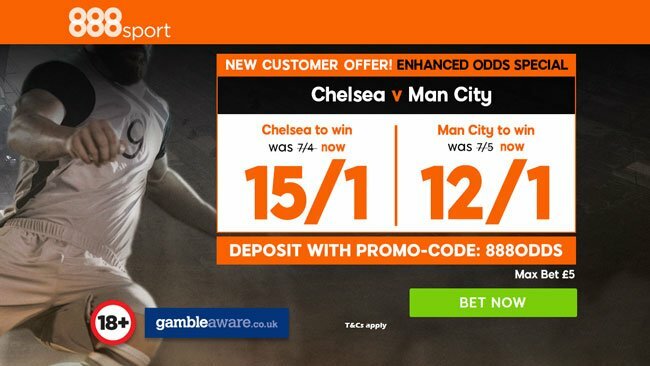 "888sport offer 15/1 Chelsea or 12/1 Man City to win! Max bet £5"